Are you interested in iron in horse feed balancers? Forageplus does not add iron to any of our horse feed balancers because iron is always sufficiently supplied in the grass, hay and haylage horses eat. So when we had also been asked on numerous occasions by our clients how much iron there was in our products we felt it was only ethical to give an honest answer based on research and rigorous testing. Our initial objective with this research was to specifically determine the level and cause of iron contamination in our range of Forageplus products so we could eliminate this as far as possible by sourcing only the highest quality ingredients. Clients had also engaged Forageplus to formulate feed plans based on their use of non-Forageplus balancer products so to do this accurately we needed to assess the mineral composition of these products particularly with respect to iron. Horse feed balancers contain several ingredients for example our Forageplus Hoof and Skin Health Summer Balancer contains 14 separate ingredients that are listed on our website. What may surprise people are the ingredients used in many different horse feed balancers often contain very high levels of iron. The negative and potentially harmful effects of iron have been discussed here. Iron has an antagonistic influence upon the uptake of other minerals which is why it’s important to minimise the quantity of iron fed to your horse. There are also many brands of horse feed balancers that have high levels of iron added into them. If minimising your horse’s exposure to iron is important to you then it is essential you choose feed products that only use the highest quality ingredients, ingredients that have been specifically sourced to have a very low iron content. Forageplus has been asked many times by our customers how much iron there is in our products. To address this, we dedicated ourselves to identifying what ingredients contained elevated levels of iron and then sourcing the highest purity ingredients to reduce, as far as possible, the level of iron in our products. After completing this work, we are confident the levels of iron across the Forageplus product range are at the absolute minimum level achievable. Forageplus also offers a feed-plan service and as part of this clients provide information of their horse’s diet. To create a bespoke feed plan we analyse their forage and factor in the full analysis of the concentrate feed they use as a daily bucket feed. We are aware that not everyone chooses to feed Forageplus products so we took it upon ourselves to analyse a broad range of horse feed balancers specifically to look at the level of iron in these products so we could balance total diets more accurately. The output from this work is summarised below and the results are quite astonishing. Fourteen samples of commercial horse feed balancer including Forageplus Hoof and Skin Health Summer Balancer were analysed for iron content. All the samples were sent to the same laboratory to ensure consistency. The laboratory is accredited by UKAS to the internationally recognised standard for competence – ISO/IEC 17025:2005 and is also approved by DEFRA under the Animal By-Products Regulations 2011, by the Agricultural Industries Confederation under the Trade Assurance Scheme for Combinable Crops (TASCC) and by the GAFTA Trade Assurance Scheme. The samples were allocated reference numbers and then submitted to the laboratory “blind” so that the laboratory had no knowledge of the product or source. All fourteen samples were analysed using the same analytical method which was ICP-OEM spectroscopy (Inductively Coupled Plasma Optical Emission Spectroscopy). Results are quoted in milligrams of iron per kilogram of balancer (mg/kg). 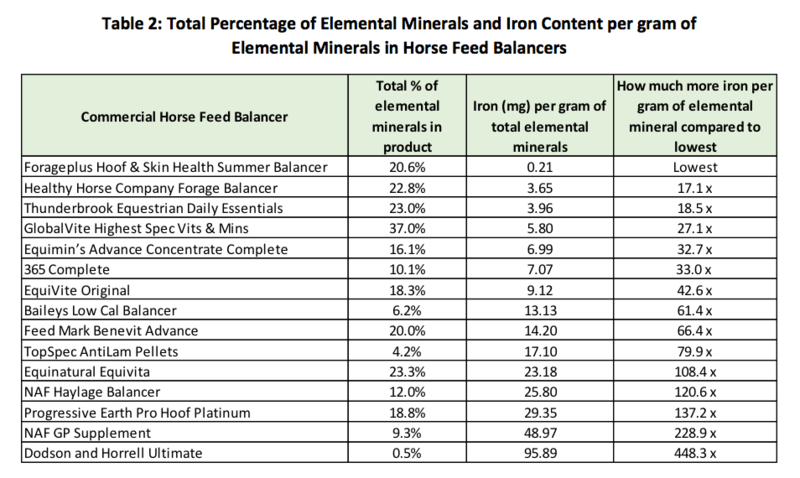 The chart above shows the absolute level of iron in the horse feed balancers tested however the quantity, type and mix of ingredients used by the various suppliers differs and this needs to be considered so we can compare the various products more fairly on a like for like basis. To do this we have just considered the total quantity of major and trace minerals in each of the 14 products tested and then assessed how much iron is being introduced from these minerals alone. The reason for considering just the minerals is explained below. Most horse feed balancers consist of a base such as linseed, minerals such as copper, zinc, calcium, phosphorus etc, amino acids such as methionine and lysine, vitamins like vitamin-E and digestive support products like yea-sacc. From our research, it is the minerals that are used in horse feed balancers that are contaminated with iron and contribute to the elevated levels of iron observed in the test results. In Table 2, below, there is a column titled “Total % of elemental minerals in product” this refers to the total quantity of major and trace minerals on an elemental basis in all the products tested expressed as a percentage. This figure was calculated from the ingredient list/analysis for each product as quoted by the company. By elemental basis we mean the actual level of each element such as calcium, zinc, copper, magnesium etc in the product. We have called this sum of all the major and trace elemental minerals the Total Elemental Mineral (TEM) content. It’s important to realise the TEM value does not provide any information regarding the combination or ratio of major and trace minerals used in each product, for example, one company may simply add a lot of one mineral such as calcium into their product (e.g. GlobalVite Highest Spec Vits & Mins) which would give a high TEM value. By contrast Forageplus uses a targeted ratio approach where the TEM content has been specifically designed to balance to the UK’s forage based on detailed statistical analysis of hundreds of forage samples. The bottom line therefore is that a higher TEM value does not mean you are getting more “bang for your buck” it is just a useful measure to compare the iron levels of the 14 assorted products fairly on a like for like basis. A comparison of the ingredients used in each of the 14 products tested is discussed in the final section of this article titled Targeted versus “Scattergun” Approach. As an example of using the TEM percentage consider Forageplus Hoof and Skin Health Summer Balancer, this has a TEM content of 20.6% which means in 1kg or 1000g of this balancer there is 206g of TEM’s. By comparison, TopSpec AntiLam Pellets have a TEM content of 4.2% meaning in 1kg or 1000g of this product there will be 42g of TEM’s. The second column of the table titled “Iron (mg) per gram of total elemental minerals” shows the quantity of iron (as tested in milligrams) in each gram of the total elemental minerals (TEM’s) present in the products tested. For example, 1kg of Forageplus Hoof and Skin Health Summer Balancer contains 206g of TEM’s which in turn contain 0.214mg of iron per gram of the TEM’s so this means in the 206g of TEM’s there will be 0.214mg x 206g = 44mg of iron which is the same value listed in Table 1. The presence of iron in the horse feed products tested comes almost exclusively from iron being specifically added to the product and contamination of the other mineral ingredients with iron. By calculating the level of iron per gram of TEM’s in each of the products tested it enables all the products to be compared fairly on a like for like basis. By comparing Tables 1 and 2 you can see how the order of the products has changed because in Table 2 all 14 products are now being compared on an equivalent basis according to the TEM content of each product. For example, in Table 1 Dodson and Horrell Ultimate had the second lowest iron content tested at a value of 502mg iron per kilogram of balancer, however when we factor in the TEM content of this product and the quantity of iron introduced from the TEM’s we see that Dodson and Horrell Ultimate is adding the highest level of iron at a value of 95.89mg per gram of TEM’s in the product. Of the fourteen products tested eight have iron added into them which are highlighted in grey in Table 3 below along with the iron levels as tested and the declared iron from the product label. The chart below shows the difference between the tested values and declared values for the products that have had iron added into them. Dodson and Horrell Ultimate and 365 Complete (both pale blue bars) had iron levels close to their declared label values but the remaining products (orange bars) had much higher levels of iron than quoted on the product label. As we have already discussed a significant quantity of iron is coming from contamination of the other mineral ingredients so iron levels higher than those quoted on the label are not unexpected. For any of the products that don’t have any iron added into them it is reasonable to state the higher the level of iron the lower the quality of ingredients was used to formulate the product. Looking at the fourteen samples tested also enables a comparison to be made regarding the approach each company has towards mineral supplementation. There are two basic approaches; Firstly, a “scattergun” approach in which a little bit of everything is added to provide a common low level of minerals a bit like sea-level being used as the common low-level reference point on Earth. Secondly, a “ratio” approach founded on contemporary scientific understanding using mineral ratios as the governing factor to determine the optimum supplementation levels based on deficiencies in forage analysed. The following chart illustrates these two extremes with the blue base representing the “scattergun sea-level” and the peaks appearing like islands and mountains showing which companies are adopting the “ratio” approach. These companies are Forageplus, The Healthy Horse Company, Thunderbrook Equestrian, Equimins and Progressive Earth all these are highlighted by red boxes in the chart. The central belief of Forageplus is that mineral and nutritional support for equines must be based on solid contemporary scientific knowledge and research. Our core philosophy is the essential major and trace minerals supplemented to equines should be balanced to the forage the horse eats and the levels of these mineral should be supplemented based on a ratio approach to counteract the negative and antagonistic influence of certain trace minerals such as iron. Forageplus has, over several years, built up a huge and comprehensive analytical database of UK and European forage and by using this data combined with modern statistical methods we have formulated our range of horse feed balancer products. Underpinning everything, is a fundamental ethos to use only the highest quality and highest purity ingredients available to minimise, as far as possible, risks from cross-contamination particularly with undesirable elements such as iron. Our initial objective with this research was to specifically determine the level and cause of iron contamination in our range of Forageplus products so we could eliminate this as far as possible by sourcing only the highest quality ingredients. We had also been asked on numerous occasions by our clients how much iron there was in our products and felt it was only ethical to give an honest answer based on rigorous testing. Clients had also engaged Forageplus to formulate feed plans based their use of non-Forageplus products so to do this accurately we needed to assess the mineral composition of these products particularly with respect to iron. We have attempted to present the results of our research in this article without bias. We have shown the results as they are and evaluated the results fairly on a like for like basis and then simply identified the lower and higher results for the purposes of comparison. Ultimately the choice of which horse feed balancer to use is a matter of personal preference and there are many factors that come into play such as cost, ease of use and my horse has always been good on product X so why change. All we have done with this article is to share the results of our work along with our company’s philosophy and answered the question many of our customers were asking. We hope you have found it useful and informative.